I want to help you raise your self-esteem in only 30 seconds a day. “You’re not good enough!” Have you ever heard that? “You’re fat!” Have you ever heard that? Have you ever started to believe in what others are saying? Let me help you believe what you are saying, not what others are saying. Hi!, I am Jeff Yalden and I make a career out of helping teens in middle school and high school find self-esteem and value themselves. I work with parents and communities to encourage them to understand their teens and inspire teens to understand their parents. I have an awesome career as a Youth Motivational Speaker. In life, you have to accept that people will tear you down and their words will pierce into your heart. I know that the speed of a hurt for a teen today is as fast as turning on and off a light bulb. You don’t have to be left feeling self-doubt, sadness, low self-esteem, and unworthiness as a result of others words in person or what you might hear or read on social media. These are the words of others. These don’t have to be the words that you speak to yourself. “Tigers don’t lose sleep to the opinion of sheep and lions don’t turn around to the bark of small dogs.” is what I tell my teens when I speak at middle schools and high schools. My question is, “Are you a tiger or a sheep? Are you a lion or a small dog?” How you feel about yourself is what matters. How others feel about you or what they might say is not what matters, but we can use their words to empower our self-respect and our belief in ourselves. I am asking for 30 seconds a day and a commitment throughout the day to make changes you feel are necessary. Let’s do this! You can do this. You should do this. This is a daily assignment and a 24 hour commitment you make with yourself. You do it first thing in the morning after your morning mirror routine in the bathroom – brushing your teeth, getting your hair did by self, and making sure you look good in those expensive clothes you want to wear because you’re thinking about acceptance of others. As you look in the mirror are you more concerned about how you look because others will judge you or are you more concerned about who you are? How you look is what others see. Who you are is what you see. How you look is cause for being judged by others. Regardless, people will judge you and you have to accept that. Who you are is the choice you make for yourself and nobody can take that away from you. You choose you and when you pay attention to who you are, how you look will take care of itself. I ask this question in every speaking engagement and the response will astound you. 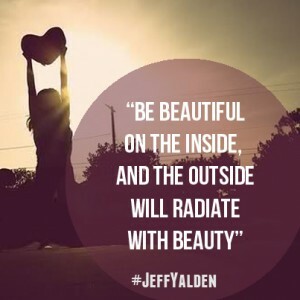 “Are you as beautiful on the inside as I see you on the outside?”, is the question I ask. Everyone that is being honest with me and themselves says, “No.” or “I don’t know.” or, they look at me with a stare and they’re embarrassed to answer. Every middle school assembly and high school assembly, every school assembly or conference I speak at, I ask this question and always get the same response. Why? Because when we are young we want to be accepted more than we want to accept ourselves. We all live with a mask trying to be who others want us to be. Look in the mirror and start to be comfortable with who you are. Then, how you look will take care of itself. Say it again . . . .
You have to look at yourself and believe it. You can’t just say it and go through the motions of speaking words. You have to believe the words you speak. You are all alone. I need you to look at yourself in the mirror and tell yourself what you need to say. Be strong and positive. At first, this will be hard, but keep on doing it. After you’ve said, “I am smart. I am strong. I am pretty/handsome (if you’re a guy). I can do anything I put my mind to.”, I want you to look at yourself and ask if what people might be saying is true. If someone says you dress funny. Can that be true? Do you dress differently than others? Does it cause unwanted attention? How about someone says you’re fat. Are you fat? Can you lose weight? Are you unhealthy? Do you have unhealthy habits? What else are people saying? Do they make fun of you because of your grades? Could it be true that you don’t apply yourself, do your homework, come to school late or don’t care? You get the point here, right? You’ve then addressed some negative things that people might say to you and you’ve found somethings to be true. Now you choose to make changes in your behavior. Behavioral Change means taking Action. Taking Action requires Motivation. Motivation and Action means RESULTS which means CHANGES because of your Behavior! You write down some truths of what others might say. Only is you can agree with the facts and truths of what is said. Don’t change for anyone. Choose to change for yourself. Now you’ve addressed the truths and you choose to take action. You’ve addressed yourself in the mirror. You’ve made positive comments and self talk. You believe yourself. You’ve asked the questions you’ve needed to ask. You’ve addressed the truth and sometimes the truth hurts. Now you are choosing to take action and committing to yourself to make changes for you only. Throughout the day, you work on what needs to be addressed. Weight – Choose healthy behaviors. Exercise. Log your food intake in MyFitnessPal or write it down. Speak to a nutritionist. Ask questions about protein, sugars, carbs, fat, exercise, and health. Choose to change. Appearance – Are you wearing glasses that are out of date? Are you wearing clothes too small or too big? What is it about your appearance? Your hair? Your hygiene? What is it? Choose to address these issues one at a time. Get new clothes. Wash and fold your clothes. Change how you wear your hair? Bathe regularly (That’s a great idea!) Remember to do this for yourself. Choices – Sometimes we act out to be accepted. We want to get a laugh from others. Choose to live in the present and choose your words and actions carefully. Don’t act out for attention. Think before you speak. Think before you do something. Think! TAKE TIME TO THINK is a motto I use everyday. In short, my message is quite simple. You get up and take care of your hygiene and prepare for the day. This process you are going to add 30 Seconds of Self Talk in a positive frame. You’ll also address what others might say. Write it down. Address it everyday and take positive action towards your own self respect. Like yourself. Love yourself. Being different is ok. You don’t have to be “Normal” to fit it. You have to like yourself and accept yourself to live a fulfilling life that has fulfillment, meaning, and a life that is rewarding. I hope you choose to do this today and start a new daily routine. * Jeff Yalden is a top youth motivational speaker and teen suicide prevention specialist in education. Jeff works with middle schools, high schools, educators, teachers, and communities addressing teen issues and teen life. For more information about Jeff Yalden, please visit www.JeffYalden.com.